For one of my research projects, I need an undergraduate/graduate (preferred) student with solid knowledge of Python, r or SQL (one would be enough). I need the person to extract data from a large local database. The database is structured and clean! I will pay $11-12 per hour. Although this project is not a big one, I might keep the student for my future research projects. I need to start as soon as possible. 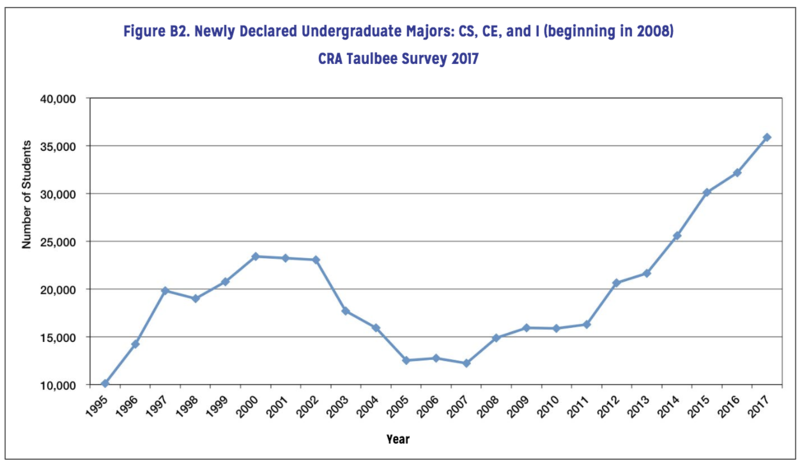 The 2017 CRA Taulbee Survey is out. 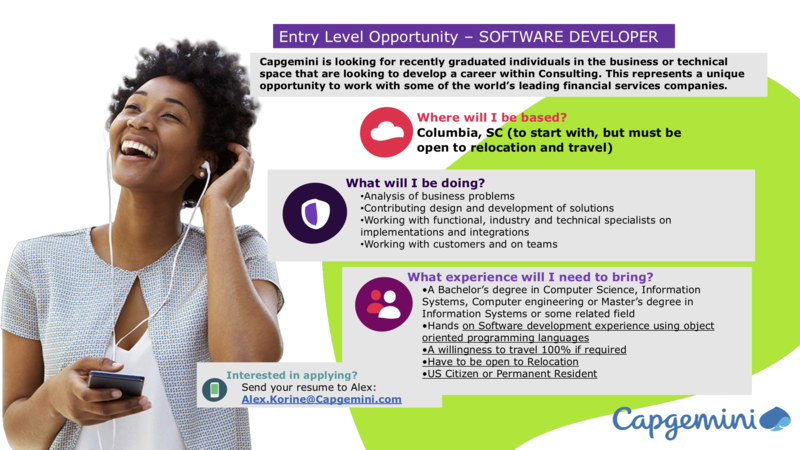 Capgemini is looking for recently graduated individuals in the business or technical space that are looking to develop a career within Consulting. The represents a unique opportunity to work with some of the world leading financial services companies. You can see the list of open positions at VC3 here. VC3 has earned the distinction of being ranked as one of the Best Places to Work in South Carolina for 2017! "We are very proud that for eight years in a row we have been named one of the Best Places to Work in South Carolina. The sustainability of our corporate culture is very important to us and this survey allows us to keep moving in the right direction for our employees," David Dunn, VC3, CEO. 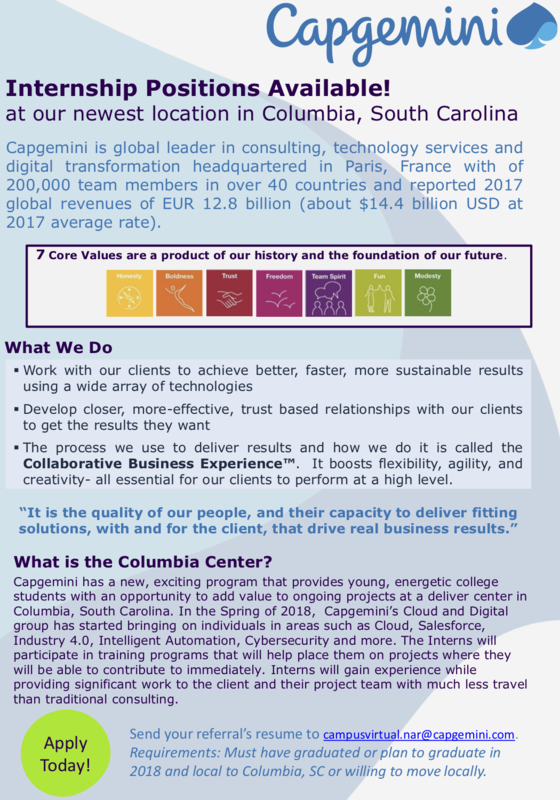 Capgemini is global leader in consulting, technology services and digital transformation headquartered in Paris, France with of 200,000 team members in over 40 countries and reported 2017 global revenues of EUR 12.8 billion (about $14.4 billion USD at 2017 average rate). I am looking for 2 talented graduate students to start in fall 2018 or January 2019. Applications at both the MSc and PhD level are welcome. The deadline for graduate applications for the Department of Civil and Environmental Engineering here at the University of South Carolina (in beautiful Columbia, land of the nature selfies!) are July 01 (Fall 2018 application) and September 01 (January 2019 application). The Department of Computer Science at the University of North Carolina at Greensboro invites applicants for a non-tenure-track teaching position (Lecturer or Visiting Faculty), available for the 2018-2019 academic year, to meet the teaching needs in our rapidly growing and vibrant Computer Science program. We are interested in both applicants with an interest in teaching long-term, and those looking to build some teaching experience in a one year appointment. To increase diversity in computing, the Department of Computer Science and Engineering joined together with the BRAID group, to obtain funding to support diversity projects including send students to attend the Grace Hopper Celebrations of Women in Computing and the Tapia conference for diversity in computing.